Refugees, both black and white, fled in advance of Lee’s June-July invasion of south-central Pennsylvania. Many Pennsylvanians of color fled to Philadelphia, where they hoped to find safety. Emilie was excited about seeing the refugees, but their stories likely aggravated her fears for her father’s safety. 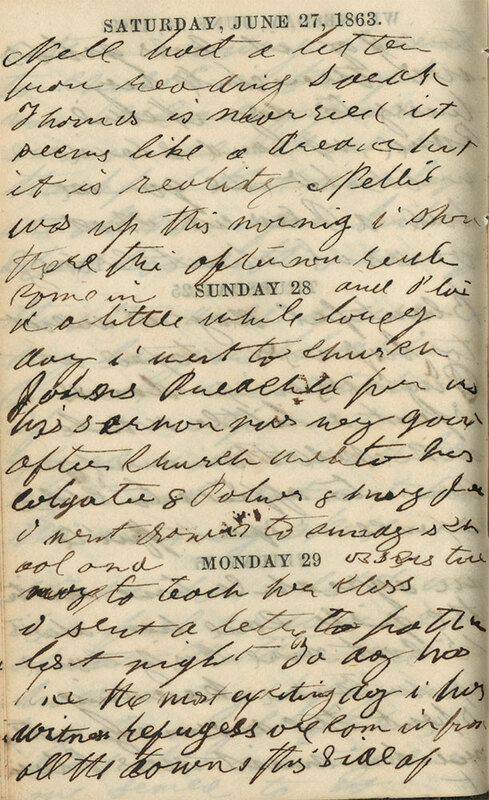 Emilie also notes this event in the memoranda pages of her diary for 1863. “The Skeedaddle from York,” The Philadelphia Inquirer, June 20, 1863; “Exodus of Colored Population,” The Philadelphia Inquirer, June 20, 1863. Emilie also notes this event in the memoranda pages of her diary, to view this entry click here.